News: IWC Schaffhausen Inaugurates Its New ManufakturZentrum. A State-of-the-Art Very Modern Facility. Last week, IWC Schaffhausen marked the inauguration of its new Manufakturzentrum with a celebration. The official opening of the new production plant for movement components, manufacture movements and cases is a milestone in the Swiss luxury watch manufacturer's 150-year history. 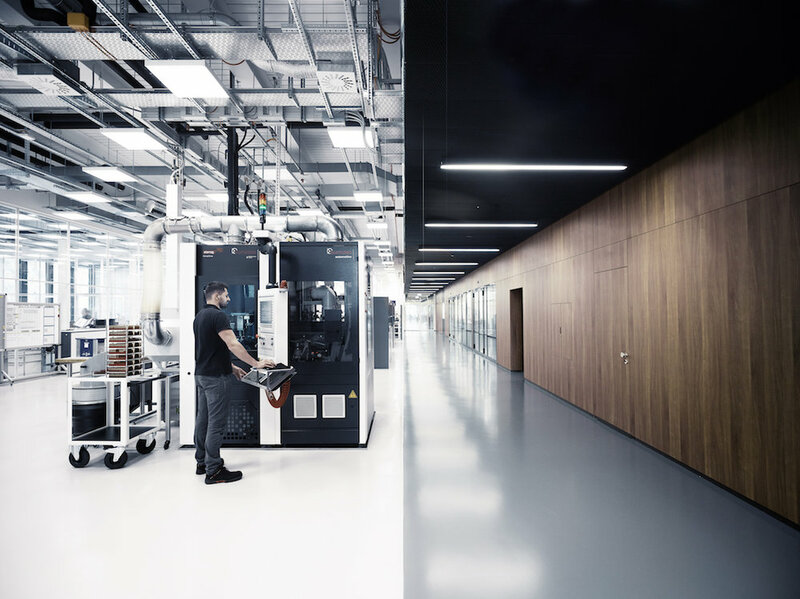 In its new production plant, over an area spanning 13,500 square meters, the Schaffhausen-based watch manufacturer brings together the production of movement components, manufacture movements and cases under one roof —a milestone in the company's 150-year history. For Andreas Voll, COO of IWC Schaffhausen, this sees a long-held hope of his finally come to fruition: "The new building has given us the opportunity to configure our production processes as is best for ensuring that they run optimally and produce perfect quality. So, for example, the entire process of creating value, from the raw material to the individual movement component and on to the finished manufacture movement, progresses in a logical order on a single storey. I have been dreaming of this ever since I started at IWC back in 2007." 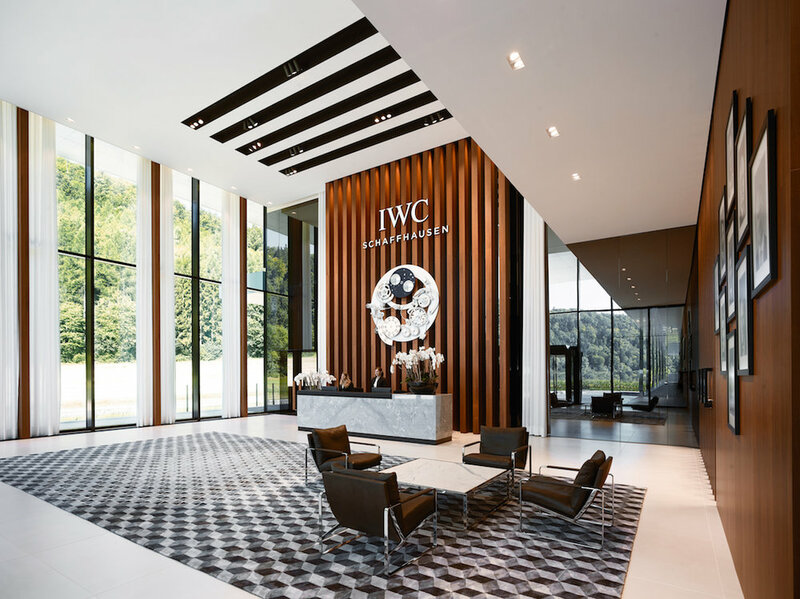 In recent years, IWC has experienced a period of rapid growth, which meant that, in its existing premises, it was increasingly being held back by its capacity limits. After extending that facility twice, it had finally outgrown the site. 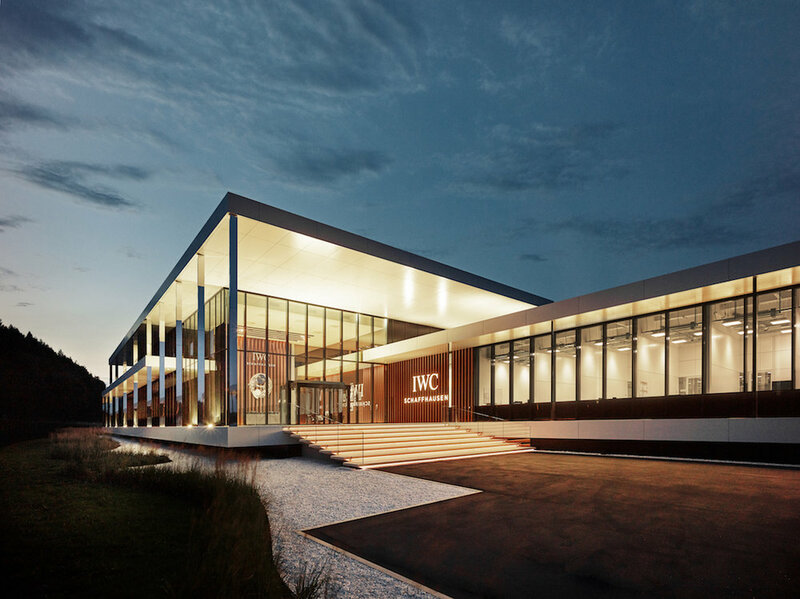 Because at that time it had been decided that IWC should embark on the strategic expansion of its expertise in movement manufacturing, the company decided that a new building was in order. Completed in just 21 months, IWC's new Manufakturzentrum sits on the outskirts of the Swiss town of Schaffhausen. Even as you approach the building, it becomes clear that the watch manufacturer has raised a monument — both literally and figuratively— in a year that also coincides with the company's 150th anniversary. The glass façade with its black frames stands in stark contrast to the white, flat roofs that extend beyond the façade. Around 80 construction companies were involved in the project, many of these based in the Schaffhausen region. 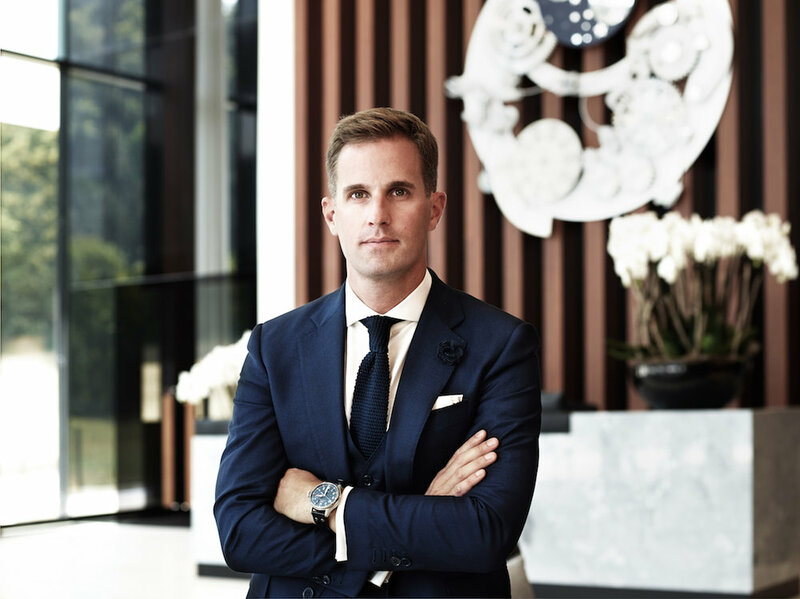 Christoph Grainger-Herr, CEO of IWC Schaffhausen mentions: "Back in 1868, our founder Florentine Ariosto Jones was already pairing traditional watchmaking with advanced production methods. Ever since he established this approach to engineering, we have been systematically developing it; even today, we continue to combine skilled workmanship and sophisticated technology in our new Manufakturzentrum. 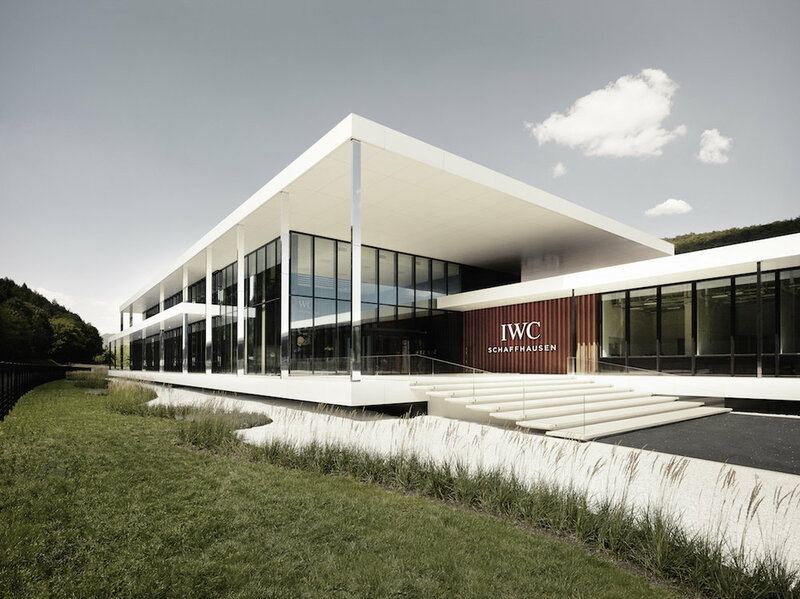 But the building has more to offer than just optimal conditions for production and excellent working conditions for our employees – it also embodies the spirit of the IWC brand and allows visitors from all over the world to see up close how our manufacture movements and cases are produced." 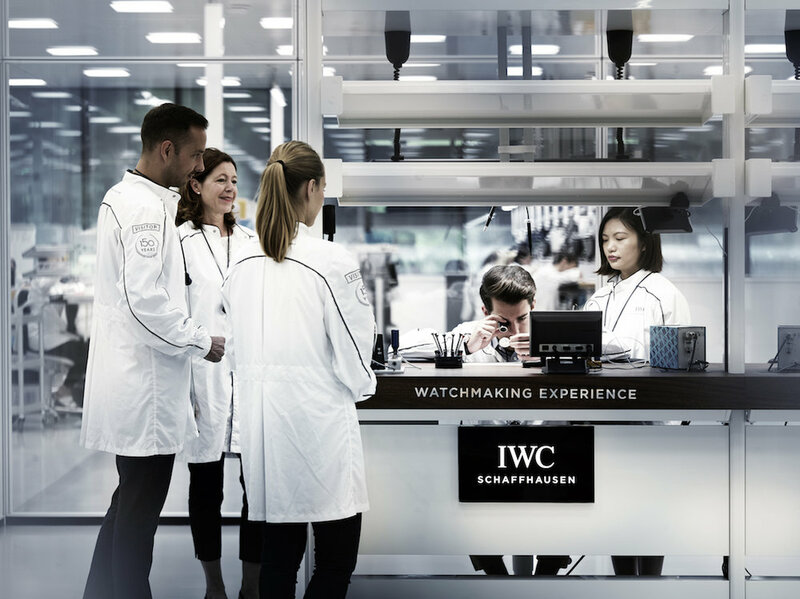 In its Manufakturzentrum, IWC brings together the production of movement components, manufacture movements and cases in one place – a milestone in the company's history. For Andreas Voll, COO of IWC Schaffhausen, this sees a long-held hope of his finally come to fruition. The imposing, 9-meter high entrance lobby affords direct access to the movement-component production workshop. This is where around 1500 components are produced, including components for the automatic movements of calibre families 52 and 82, the hand wound movements of calibre family 59, and the chronograph movements of calibre family 69. Complex components are manufactured, such as bottom plates, bridges and oscillating weights, as well as small components including switching levers, springs and latching elements. Some parts are so small that they are barely visible to the naked eye. This department's activities also encompass the production of components for complications, such as perpetual calendars, annual calendars and tourbillons. Mechanical watches are sophisticated mechanisms in which as many as several hundred individual components work ceaselessly to fulfill their function. The need for precision is therefore incredibly high. "At the end of the milling process, a bottom plate for the calibre 52, for example, must have around 400 geometric features; it must be produced with minimal tolerances in the region of a few thousandths of a millimeter", explains Voll. This is why most of the steps involved in producing movement components are automated. Only the most advanced computer controlled turning and milling centers are capable of producing these components to the required standard. The bottom plate for the calibre 52, for example, is milled by a cutting-edge machining center that can machine multiple brass blanks in a single clamping arrangement. This allows the tools and machining positions to be automatically changed and maximum precision to be achieved. An articulated robot is responsible for feeding in the raw material and removing the finished components. Movement components receive the desired surface finish properties in the electroplating shop. "The main purpose of this is to provide protection against corrosion and to make the components visually appealing. A protective coating made from nickel and rhodium, for example, prevents brass components from tarnishing and developing patina. It also gives the components their silvery white colour", elaborates Voll. Movement components that are engraved are particularly complicated to produce. For example, the barrel bridge is first gold-plated all over and then a coating is applied to the engraving. Once the Côtes de Genève have been added, the components are rhodium-plated in an electroplating bath and any remaining coating is washed off. The engraving now gleams in dazzling gold. The transition from movement-component production to movement assembly is seamless. While the production of the movement components is largely automated, assembling the manufacture movements is a delicate operation that must be performed by hand. It is beyond the capabilities of any machine to piece together the complex mechanism and bring it to life. At the pre-assembly stage, plates and bridges – which together form the 'ébauche' —along with a number of other components, are assembled to form a unit. These finished assemblies are later sent to the assembly lines together with components that are kept in stock. It is on these assembly lines that manufacture movements such as calibre families 52 and 69 are assembled. A line concept has been developed for assembling the movements that builds on F.A. Jones' visionary idea and develops it even further. Breaking the assembly process down into multiple sub-processes allows us to assign a specialist with specific expertise to each individual step. "Having the assembly process for our different calibre families organized into dedicated lines enables us to maximize the quality standards we are able to attain", says Voll of the key benefit. An innovative oiling machine developed by the employees themselves allows up to several dozen oiling points in the movements to be lubricated with the utmost precision.Even tiny amounts of dust or dirt can impair a movement's performance. For this reason, the components are assembled in a clean room atmosphere; the conditions here are similar to those established for the manufacture of computer chips. Fifty thousand cubic meters of air are circulated every hour. The pressure in this environment is above atmospheric pressure, making it even harder for dust particles to find their way in. The basement of the Manufakturzentrum houses the case production department. Stainless steel, titanium, platinum, red gold, white gold and bronze watch cases are manufactured here. Since the 1980s, IWC has been accumulating a wealth of expertise in the machining of challenging case materials. The latest material innovation to come from Schaffhausen is Ceratanium: "This groundbreaking new case material is as robust and as light as titanium and as hard and as scratch resistant as ceramic materials", says Voll. Even a simple case comprises a great many individual components. If you then add functions such as a rotating bezel or chronograph pushers to the mix, the number of components rises rapidly to several dozen or more. The machining process for the blanks is customized using computer-controlled turning and milling centers. Depending on the material and case type, between 30 and 50 cases can be made from a meter long bar. The milling process alone can take hours. Manufacturing a platinum case for the Portugieser Grande Complication, for instance, is incredibly time-consuming because the material is difficult to machine and the geometry is complex.Once they have been machined, the cases proceed to the surface finishing stage, in which they are polished. The final clean and the final inspection then take place in a clean room atmosphere once again and once again, these are delicate manual tasks. "Only the human eye is able to assess the quality of a surface", states Voll. For more info on IWC click here. Posted on September 6, 2018 by Editor & Publisher and filed under News, IWC and tagged IWC ManufakturZentrum IWC IWC Schaffhausen 2018 IWC Portugieser Perpetual Calendar Digital Date-Month 75th Anniversary Edition Most Popular.